Splawn amp - WOW! Anyone else use them? Discussion in 'Amps and Cabs' started by oxtone, Jun 5, 2008. 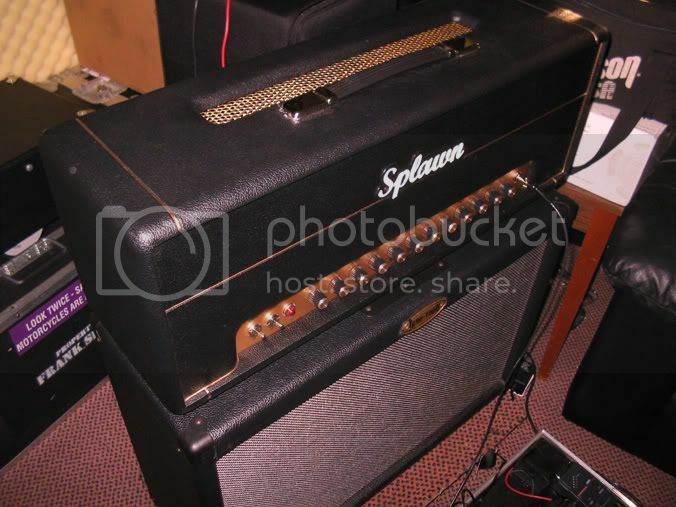 Recently I tried a used Splawn "Quick Rod" amp, and it sounded GREAT the moment I plugged into it! It is probably the best hot-rodded "Marshall"
type amp I've ever tried. My Walnut "The STRAT" with Vintage Vibe SP-90's sounded fantastic with this amp, either clean or in overdrive. The clean channel was very, very good, better than any Marshall I've tried/used. The distortion channel was thick and harmonic, and very musical. Anyone else out there with Splawn love? I love my Quickrod. Like an idiot I contemplated selling it because my new band is bit more on the indie rock side. Luckily I didn't and the Splawn sounds great and contrasts well with the other guitar players Fender Twin Reverb. It's a lot more versatile than people give it credit for. I had an early quickrod and it was a mean machine. Scott Splawn was very nice to deal with too! I had a Version 2 QR and loved it. I do miss it at times, but my hearing sure doesn't! :AOK I sold it because it really had to be CRANKED to sound it's best. I just didn't need a 100 watt Fire Breather for my amp needs anymore so it went bye bye. I do agree that it's one of the best, if not the best, Hot Rodded Marshalls out there! I also agree that Scott is a pleasure to deal with and a True Gentleman as well! Don't hesitate to deal with Scott direct, but if you're looking for a used QR they are seemingly always available over at HC. I recommend using lower wattage speakers with it. Once I switched from 60w Celestions Vintage 30's to 30w Scumbacks I was able to get better tone without getting retarded loud. Here is a youtube clip of the Splawn Nitro..................killer!! I liked Gear #2 the best - seemed like the middle ground worked best with my pickups. If I was doing big gigs, I'd buy it in a heartbeat! My one concern was the Solo knob - it was too loud the moment the pot engages! I wish it had a slower taper for more control over the Solo function. I love my purple Competition. +1 A class act all the way! I had two quick rods and they were great for that smokin Marshall tone. I think I liked the original version the best, but the new amps have a nicer clean channel if that is important to you. been a huge splawn fan for over two years now. i own a quickrod and a nitro. both amps are killer. the quickrod is what first sold me on splawns. Great picture windsen, i've been looking at Splawn a lot lately, and those look great! sorry for the poor production quality. TELL ME ABOUT YOUR PRODUCTION. you are also getting better with your production too. hard to believe just an sm57! thanks steve! yea i am really still learning the ins and outs of recording and production. my setup is as simple as it gets. single sm57 into an m-audio firewire solo into my laptop. sometimes its hit or miss for me. there are so many variables that come into the picture, even with just a single mic. but thanks for the listens and kind words! I love my Quickrod. When I first demoed it with Josh Sage of Rebel Amps, I played it against a Voodoo V-Plex, a Wizard, an ENGL Powerball, an ENGL Blackmore, and an ENGL Invader. For the tones I was seeking (70s blues/hard rock - ZZ Top, Humble Pie, UFO, Whitesnake, as well as some 80s like George Lynch, Demartini, Van Halen), The Quickrod smoked them all (except maybe the ENGL Blackmore). the new mic is much clearer and doesn't have that muffled/distant thing going on. A couple splawns QR's here, too. Version two and three. I do like the v2 better. has a little more overtone to the sound. I found my sound with the scumbacks H75/M75 mixed in each of the splawn cabs. Now one marshall cab has all H75's. Very good too. Scott Splawn is a great guy to work with, and has some of the best customer service in the industry. OK Check it out, the only Splawn Competition Combo made (that I know of). 50 watts, loaded with scumbacks h75's.